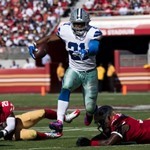 Ezekiel Elliott had 219 yards from scrimmage (career best) and scored three touchdowns (tied a career best) to lead the Dallas Cowboys (3-3) to a 40-10 win over the still winless San Francisco 49ers (0-7) on Sunday. On Tuesday, Elliot got a second injunction to temporarily avoid a six-game suspension on charges of assaulting his ex-girlfriend. On Sunday, he also gained 72 yards through the air to lead the Cowboys to their first win since September 25. Elliot, rushed for 147 yards on 26 carries, scored two touchdowns in the first quarter and scored another in the third after gaining 72 yards on a short pass from Dak Prescott. It was Dallas’ first possession of the second half, that gave the Cowboys a 27-3 lead that basically decided the match. The Cowboys spoiled C.J. Beathard’s first start as 49ers quarterback, who led his team to three punts a field goal and a fumble on the team’s first five drives of the first half. For the day Beathard’s was sacked five times, lost two fumbles as he completed 22 of 38 passes to finish the day with a quarterback rating of 21.6. The 49ers first score came via a Beathard four-yard run during garbage time in the fourth quarter when the game’s outcome was already decided. Prescott finished the day with three passing touchdowns and also ran for a score from the 2-yard line. Besides Elliot’s 72-yard gallop Prescott connected with tight end Jason Witten for an 18-yard score and receiver Dez Bryant who hauled in a touchdown from the two. In Green Bay Drew Brees completed a 22-yard touchdown pass to Brandon Coleman, Mark Ingram scored on a 12-yard run and the New Orleans Saints overcame several errors to defeat the Aaron Rodgerless Green Bay Packers 26-17 Sunday. Will Lutz got two field goals in the second half, including one of 44 yards that gave the Saints a 19-17 lead that they never relinquished. With 4:55 left in the fourth quarter, Brees scored a rushing touchdown from a yard out to put the Saints up 26-17 and spoil the first start of Packers’ quarterback Brett Hundley.